Prof. Mamdooh was a police officer in Egypt for (19) years in Egypt. His various consultative posts in the field of police, security, and law in Qatar for (7) years, and United Arab Emirates for (16) years. He participated in countless conferences and symposium, published studies and research around (160) journals and articles. He is also a lecturer and trainer in the field of criminal justice, police, and law in Egypt, Qatar, KSA, UAE, Italy and the U.S.A. For 3 years he is a notable Visiting Professor in U.S.A at Sam Houston University and Grambling State University.Prof. Mamdooh is a registered and licensed Advocate before Supreme Administrative Court and Court of Cassation and a certified International Arbitrator. Since 2008, he is the Editor – in – Chief of "Alfikr Alshurti" Periodical Journal. The "Alfikr Alshurti" is a quarterly, scientific periodical refereed and indexed, specialized in Police Sciences and distributed worldwide. The"Alfikr Alshurti" is the 1st International Periodical Journal to receive an International Organization for Standardization (ISO) Certification (ISO 9001:2008) in 2015 by the effort of Dr. Mamdooh Abdelmottlep. Excellence Award in 2013, and (2) Mohammed Bin Rashid UAE Government Excellence Award in 2014. He received several awards both local and regional, and the most prominent award is the (1) Distinction Award in Public Administration in 1976, and (2) Academic Distinction Award for obtaining Ph.D. in 1980, both awards were received in Egypt. An awardee of Ideal Employee Prize by Sharjah Police UAE in 2011, 2012 and 2013 (three years in a row), and in addition to his awards are Employee Excellence Award from UAE's Minister of Interior in 2014, and a distinction Excellence Performance Award from H.H Ruler of Sharjah in 2014. He is the Founder and Executive Chairman of the International Police Science Association- IPSA, a non-profit organization that brings under one roof of experts, researchers and scholars, concerned with security work from all over the world. The IPSA convenes an annual conference and offers an international award which has 3 categories namely: (1) Police Practices and Community Relations, (2) Development and Police Researches, and (3) Innovation in Policing. The IPSA has three major projects (1) Security knowledge management through translating police sciences research into various languages, (2) Sharing experience and expertise through conferences, workshops, seminars, and training. (3) Assessment of policing performance through the annual report of World Internal Security and Police Index (WISPI).www.ipsa-police.org. Prof. Mamdooh conceptualized and championed an international security index which is World Internal Security and Police Index (WISPI).The " (WISPI)" measures the capacity and efficiency of the police and security service providers to address the internal security issues in the world countries through four (4) key areas, as follows: (1)The possibilities available to the Police, (2)The Security Operations carried out by the Police to achieve security,(2)The results of the security performance in terms of the security of the society and the safety of its individuals,(4)The Legal Framework that governs the Police Work in terms of the Human Rights, and that is done by using sixteen (16) Measurement Indexes, The WISPI was designed and constructed by experts and scholars in the fields of security, crime, criminal justice, statistics, mathematics, politics, sociology, and psychology, in collaboration with Institute for Economics and Peace (IEP) and International Police Science Association (IPSA) and by the support of Sharjah Police. The index ranks 127 countries worldwide. www.wispindex.org . 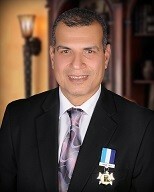 In November 2014, Dr. Mamdooh received an International Prize Award from the Institute of Italy, the CRIMINOLGIA.IT for the recognition of his tireless efforts in the development of police sciences, and the restructuring of Arab Police bodies in terms of training, education, organizational structure, academic specialization and re-delegation of responsibilities between police bodies, various government sectors, and the private sector. The award ceremony held at Chamber of Deputies in Rome, Italy. CopyRights 2019 All Rights Reserved to IPSA-Police.